Posted on July 30, 2012 by Clare Cooks! It’s been a while. There have been many deterrents to blogging (and cooking) in the last few weeks, including, but not limited to: chopped off fingers, emergency room visits, a sick dog, two well dogs, another sick dog, summer school, party planning, and other assorted things. But enough of all that. This salad is wonderful. It comes together quickly and is great for a summertime meal. 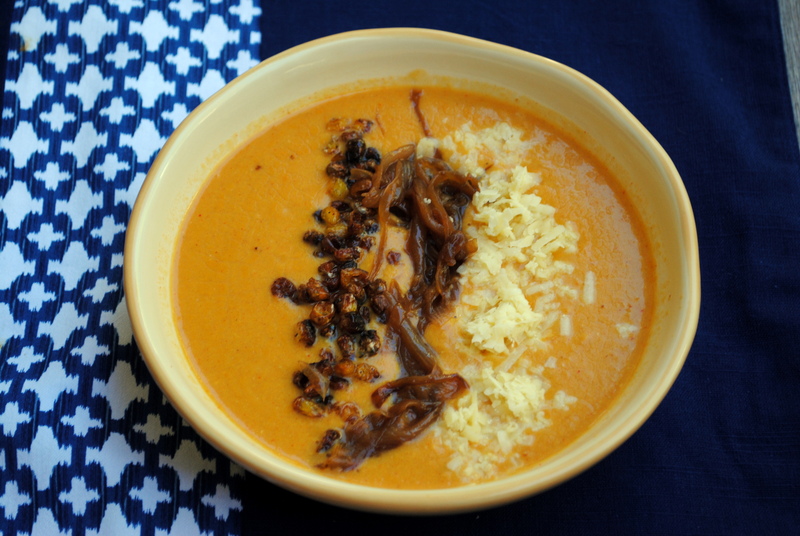 It’s light, tasty and requires minimal effort, which makes it close to perfect in my book. I also think that you could toss this into a tortilla and you would get a great, light(er) burrito or taco. If you left the chicken out, it would be even easier to prepare. I think it would make a great starter or side salad for a Mexican meal as well. I thought that lime juice and a bit of olive oil made for the perfect dressing. You really don’t need to add anything more to it. The dressing was even better when it mixed with the spices from the chicken. They blended together perfectly. Heat the olive oil over medium-high heat. Sprinkle chicken breasts with garlic powered and chipotle to taste. When oil is hot, add chicken and cook until done, about 5-7 minutes per side. Remove from pan and allow to cool slightly. Slice into pieces. 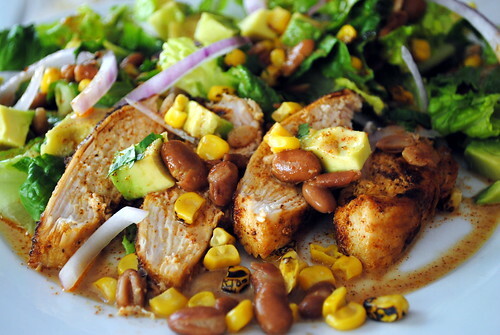 In a large bowl, combine the lettuce, corn, avocados, beans, onion, and cilantro. In a small bowl, whisk together the oil, lime juice, cumin, ¾ teaspoon salt, and ¼ teaspoon pepper. Drizzle dressing over the salad and gently toss. Posted on September 16, 2011 by Clare Cooks! I made this quick and delicious curry for lunch the other day. Start to finish, it too about 20 minutes. It would have taken less if I had read the ingredient list before hand and realized that the potato was meant to be cooked, but it still turned out to be great. I added some chopped red and green onion for some extra flavor and I also accidentally dumped in about 4 times as much cayenne as I wanted. The pepper definitely was noticeable, but not overwhelming at all. In a large non-stick skillet, heat the oil over medium-high heat until shimmering. Add the mustard and 1/2 teaspoon of the cumin seeds. Cook until fragrant, add the garlic and potatoes. Cook, stirring often, until the potatoes turn golden. Add the tomato, cilantro and green chile. Cook for 1-2 minutes longer, then add the corn and stir to combine. Add coconut milk, salt, and lemon juice. Stir and bring to a simmer, then cover and cook until the corn is cooked through. Posted on September 2, 2011 by Clare Cooks! This salad is one of the prettiest dishes I have ever made. And one of the tastiest too. We had a midweek barbecue for dinner one night this week and I wanted to make a quick and easy salad to go with the rest of our meal. Green salad seemed a little lame, potato salad seemed a little much. This recipe seemed to balance out the two perfectly. The ingredients made for a perfect summer salad. The potatoes made a great base for the rest of the salad. 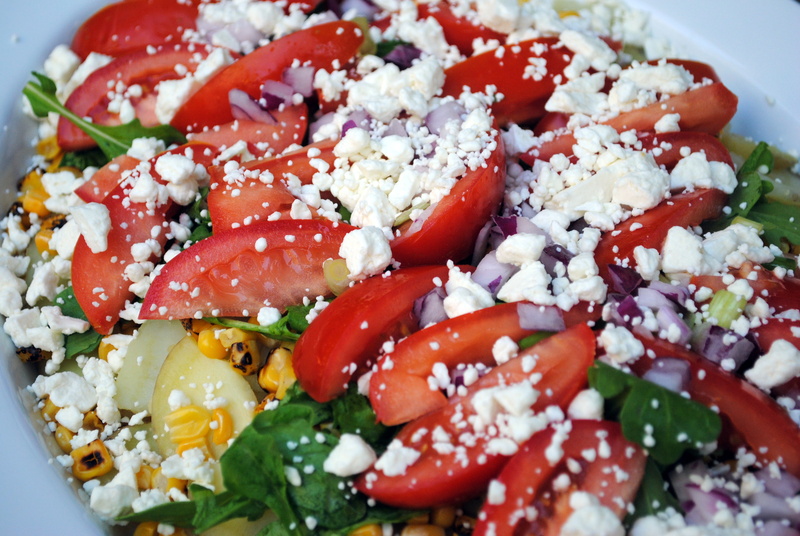 The corn, tomatoes and arugula just screamed ‘summer!’ to me and were perfect with the vinaigrette and feta. 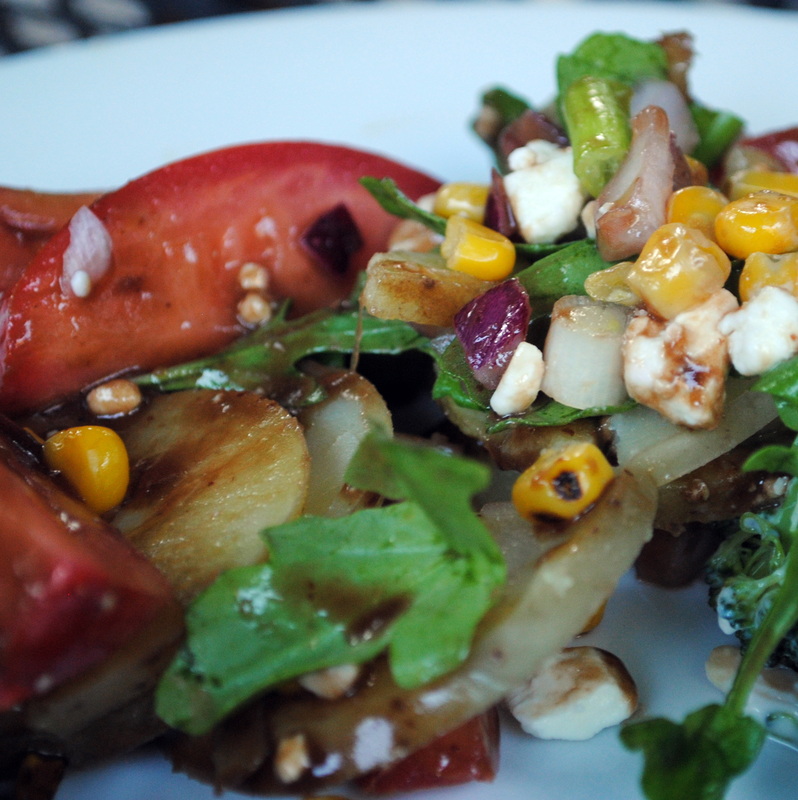 This salad would be perfect for any late summer barbecues you might be doing this Labor Day weekend. In medium saucepan cook potatoes, covered, in enough boiling salted water to cover for 5 minutes or until just tender. Drain and cool. Cut corn from cob. On large serving platter arrange the potatoes and tomatoes. Sprinkle with corn and 1/4 cup basil. For dressing, in a screw-top jar combine oil, vinegar, shallot, mustard, sugar, and salt and pepper to taste. Cover and shake well. Pour dressing over potato mixture. * Sprinkle salad with feta cheese and basil leaves. Makes 8 to 10 servings. *Make Ahead: Refrigerate salad up to 4 hours. Sprinkle with feta cheese and basil leaves, and let come to room temperature before serving. Posted on August 19, 2011 by Clare Cooks! So, I originally set out to make corn chowder, but apparently chowder requires potatoes and we were out. So, then I decided to make corn soup, but after some intensive googling, I could not find a single recipe that sounded good. So, then I decided to make my own. It turned out to be fairly delicious if I do say so myself. 5 fresh cobs of corn or 3 cups frozen sweetcorn, thawed. In a large heavy, pot, heat the olive oil over medium. When heated, add garlic and onions. Cook until translucent and starting to brown just a bit. Add in defrosted corn. Stir until heated through. Remove from heat. Place garlic, onions and corn in a blender and blend until smooth. You might need to add in a bit of broth to get things moving. When blended return to pot and add paprika and chipotle and stir together. Add broth and heat until soup begins to boil. 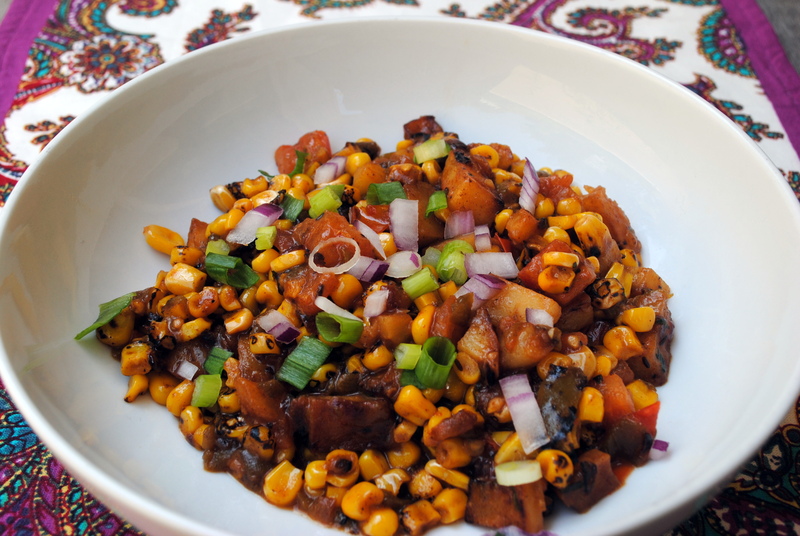 Serve in bowl and top with roasted corn kernels, caramelized onions and cheese. Serve and enjoy! Heat oven to 425. Line a baking sheet with parchment or tinfoil. 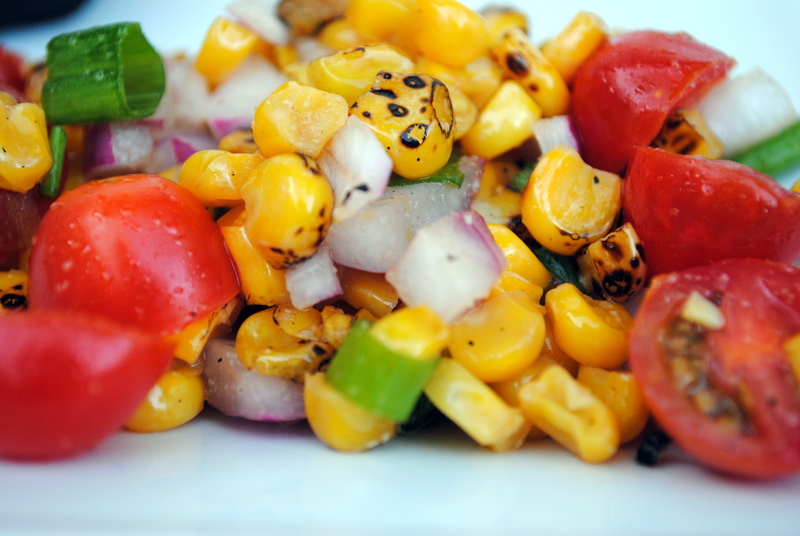 Spread out corn on baking sheet, drizzle with olive oil and sprinkle with salt and pepper. Mix around to coat. Put corn in oven. Check after 15 minutes, rotate baking sheet and cook for up to 5 more minutes until corn begins to get crunchy and start to pop. Posted on July 22, 2011 by Clare Cooks! At the moment, I’m currently obsessed with corn. There’s something about it that’s just oh so summery. 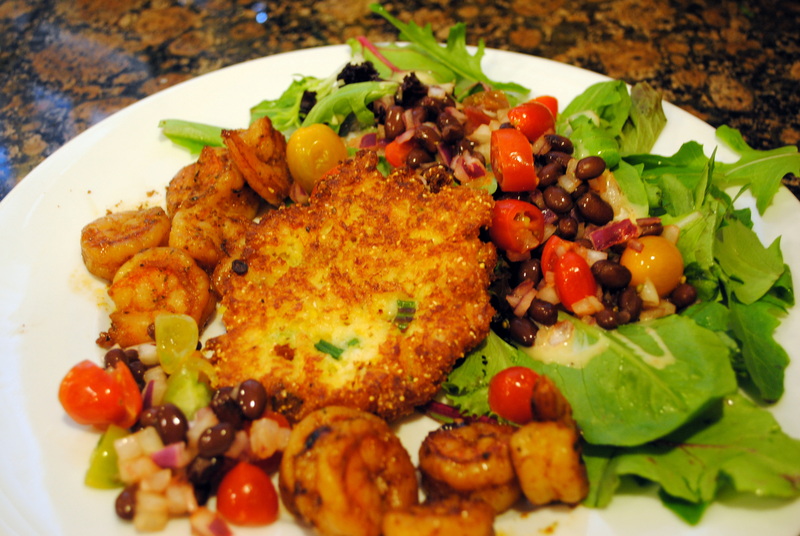 I threw this quick and simple salad together for a last minute dinner side dish. Excellent decision. It turned out to be really tasty. Something I would definitely make again. It can stand alone or fill in as a side dish or salad topper. I really loved the colors of this salad and the ingredients all accompanied each other very well. Heat olive oil in pan over medium high heat. When heated, add corn and garlic powder. Sautee until corn is defrosted and/or warmed through. Remove from heat and pour into medium bowl. Add red and green onions, tomatoes, salt and pepper. Top with vinegar and mix all ingredients together. Serve at room temperature or chilled. Posted on April 12, 2011 by Clare Cooks! I generally try to have a rough plan of the week’s dinners. It’s not really set in stone, but I like to be able to take care of groceries and prep work ahead of time. I’m still trying to get organized from my weekend trip to San Francisco, so planning tonight’s meal definitely did not happen, but it turned out to be a pleasant surprise! Tonight we whipped up some gluten-free corn cakes with grilled shrimp on a bed of mixed greens topped with onion ‘salsa’. It was quick, simple and super tasty. What else do you really want from a meal? 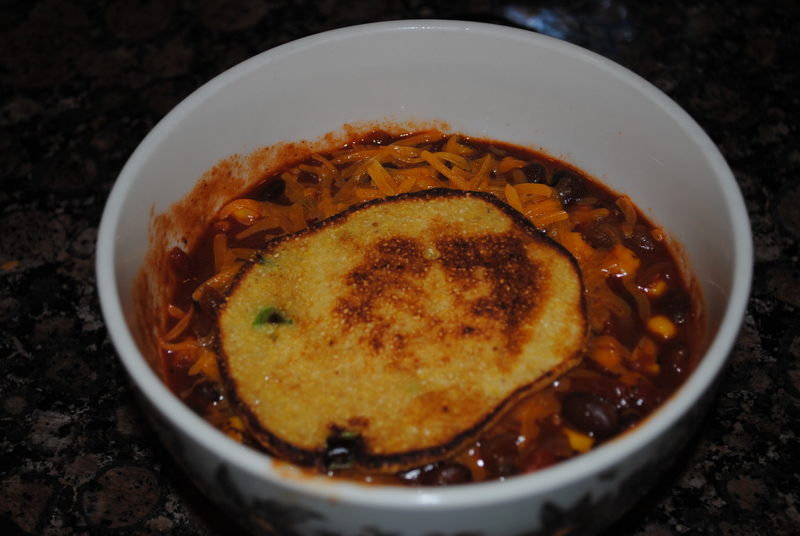 I based my gluten-free corn cakes on this recipe with several adjustments made for food allergies and personal taste. Pulse the corn kernels, egg, milk and butter together in a food processor. I like my cakes to have a few chunky kernels in them, so pulse to your own preference. In a large bowl, combine the next 5 ingredients with the corn mixture until the dry ingredients are mixed with the wet. Heat the oil in a pan and then place spoonfuls of the mixture in the pan. Cook for about 3 minutes on each side, until golden brown. Serve and enjoy! 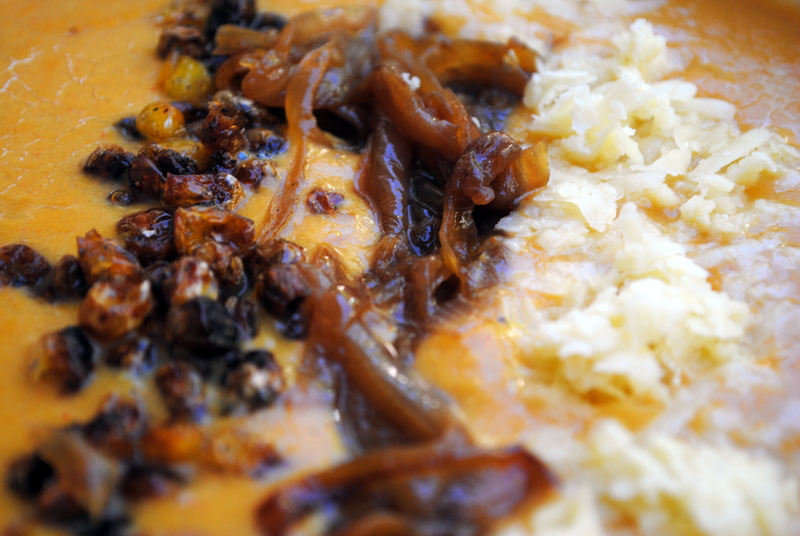 Mix all ingredients together in a large, non-reactive bowl. Allow to mariniate together for a little bit (like 15 minutes) before serving. Posted on February 26, 2011 by Clare Cooks! Winter has apparently decided to rear it’s ugly head here again in California. I have decided I like the idea of rain better in theory than in practice. It’s fine for a couple hours, but then it just gets annoying. And my, oh my, did they make for a delicious bowl of chili. Heat olive oil over medium-high heat. Add onions and garlic. Sauté until soft. Add salt and pepper (to taste), along with chili powder and paprika. Stir into onions and sauté for a couple more minutes. Add black beans, corn, vegetable broth, diced tomatoes and tomato paste. Stir well to blend with onions. Bring to a boil. Reduce heat to low and allow soup to simmer for 10 minutes.